I love reading the scriptures and learning something new! 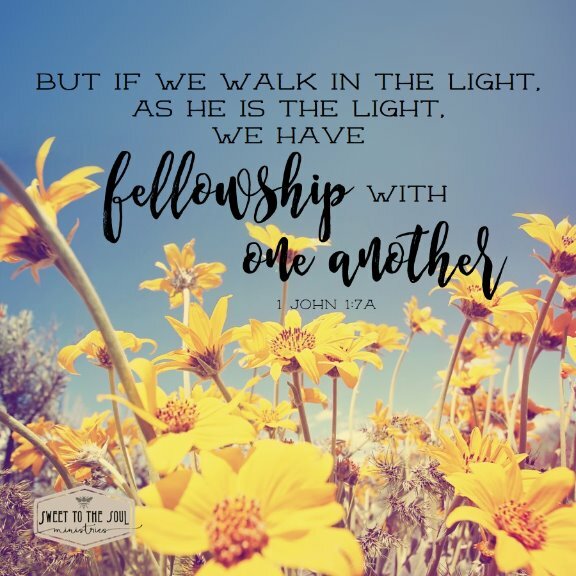 I had thought todays scripture, 1 John 1:7 was speaking of a fellowship of believers who walk in the light, but it's much more special than that. John is telling us about a much deeper relationship, a "mutual communion" between us, as individuals, and God. Where we are so closely intertwined that we begin to appear like Him and actually start to partake of His nature. They say, the longer a couple is around each other the more they start to sort of morph into each other. Displaying same mannerisms, speaking the same phrases and in the same tone and even completing each other sentences because they are so in tune with one another. These outward transformations only occur with the closest of relationships. It becomes second nature, effortless. One is not trying to behave like the other, it's just that their natures have become alike. ​My daughters are only 12 months and 10 days apart in age, and growing up, they were often asked if they were twins. For outsiders, their physical appearance and mannerisms so closely resembled that some couldn't tell them apart. But I was their mom, and I knew all of the very specific details about each one of them. As they grew, they began to take on some of my own mannerisms, which was not always a good thing! But in one sense, they actually liked to have a little fun with it. I've always had a distinctive accent - part southern, part Texan, part country; but they both learned to nail it and could sound just like me. And who was the most frequent recipient of their special talent? My poor mother. They were quite pleased with themselves when anytime my mother would call the house, they would answer and she would think she was talking to me. They had my accent down pat, as well as my common phrases and responses. Thankfully they never could quite master my signature! But they had spent so much time hearing my voice that they actually began to speak the same way. They became so familiar with the phrases and responses I would give, that they became their phrases and responses. Oh, and let's not even talk about the physical mannerisms. Yes, I have two adult mini-mes now. This is the type of fellowship John is speaking of for us as children of God. That we can enjoy such a closeness, a deepness of relationship with Christ that we can actually start to become like Christ. We can respond as Christ would when we are challenged by the world, we can love like Christ loves when we are confronted with hatred, we can forgive like Christ has forgiven when we are wounded and hurt. What a beautiful gift from God, that He wants to have this type of relationship with each and every single one of us. To know that He is not some unreachable figure somewhere "out there" or just a name recalled in historical writings. What did you learn from today's scripture? ​Haven't downloaded your 7-day Scripture Journal and Reading List? The Soul Deep Mini-Series Scripture Journal is a bit different format from our regular 31-day Scripture Reading Journal. The blank journal format is provided for you to use any study method you prefer. It may be more in-depth than the single page can hold, if so, feel free to print multiple copies. If you would like to see some in-depth study options, we've explained the methods used in our 31-day journals here. ​For me, I looked up today's scripture in my Bible and read it in context, taking in the verses before and after. I then opened BibleHub.com and searched today's scripture. This provided other translations of the scripture as well as several commentary resources. Then made my notes about the commentary information which spoke to my heart. I'd love to hear how God spoke to you through today's scripture, will you share with us below? 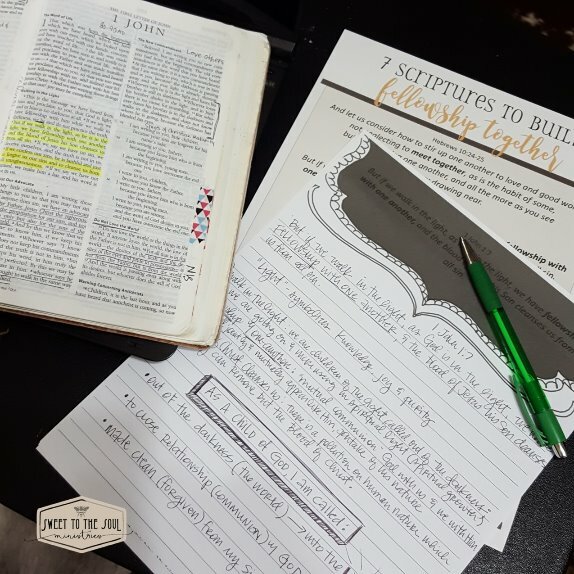 The Mini-Series Scripture Journal also makes a great group study tool! ​If you have meetings with a group of friends to study God's Word, please, share our Scripture Journal with them. Feel free to download and print as many copies as you need for your study group. Put "fellowshipping" in action by gathering some friends together to discuss the scripture teaching and how they can be put into practice. 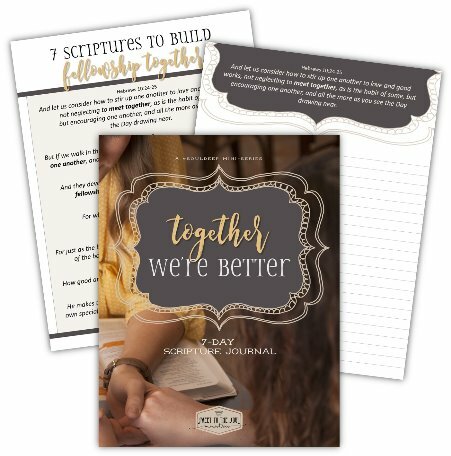 If you use the #TogetherWereBetter 7-Day Scripture Journal for your study group, I would love to hear from you! Encourage others by letting them now how you are fellowshipping together.